Meet Your Neighbor Robbie Talbott of Stronghurst. He is presently living with his Aunt Nadine Mowen. Robbie is employed by NTN Bowers in Macomb. He was born in Monmouth and raised in the Blandinsville area. In 1999 he graduated from Widefield High School in Colorado Springs, Colorado. His mom is Patti Glover of Colorado Springs, Colorado. Patti is employed at Wal-Mart in Colorado. 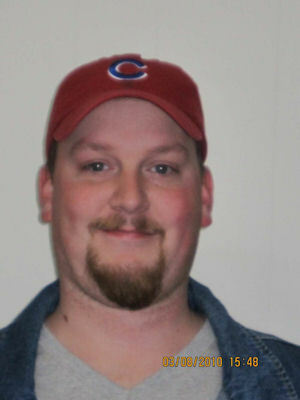 His father, Larry Talbott lives in Blandinsville and is employed at NTN Bowers in Macomb. His step-parents are Gary Glover and Sherri Talbott. Robbie has one brother, Daniel of Denver, Colorado, and one sister, Elizabeth, who is a college student and lives in Colorado Springs. He also has two step-brothers, Nate and Jeff, and two step-sisters, Shey and Holly. When asked what he likes to do Robbie replied, "Spending time with family, my dachshund, Buddy, occasional fishing and reading mystery books."